The centerpiece in your kitchen is the refrigerator. You use it to keep your meats, dairy, and produce cold. When your refrigerator is broken the thawed or melted food may go bad and need to be thrown out. Nobody wants to lose perfectly good food. That is why it’s important to fix a broken refrigerator right away! Contact an appliance repair company that provides same-day repair service for freezers and refrigerators. When you come to Longmont Appliance Repair you have come to the right place. We routinely repair both common and complicated refrigerator problem during an initial service call on the same day you call us for help. We work quickly to make sure your freezer refrigerator or is working again and before any food has to be thrown out. The most common reason we are called about refrigerators is because of loud noises The most common causes for a noise coming out of a refrigerator are problems with the evaporator fan motor or condenser fan motor. When you call us, try to say where the noise is coming from so that we can be sure to bring the right parts and tools to fix the loud noise before the refrigerator stops working entirely. 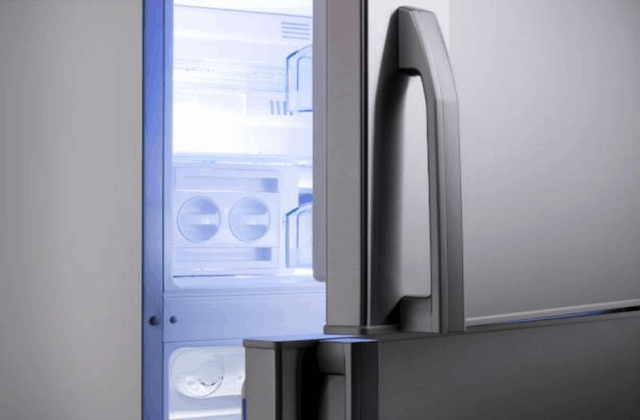 Our certified appliance repairmen routinely fix refrigerator leaks. The common reasons for refrigerator leaks are a broken water inlet valve or an issue with the door closure or latch. We routinely stock our service vans with the necessary tools and parts to fix these issues on our first service call. When your refrigerator won’t run, check to make sure it is plugged in and the circuit breaker has not tripped. If these are OK, you have either a broken compressor overload relay or a temperature control malfunction. Call us for same day repairs. Call us for same-day repairs if your icemaker does not make ice. The problems are broken water fill tubes, temperature control problems in the freezer or a water inlet valve that is broken. Also, your ice maker may work too slowly or make smelly ice cubes. We routinely repair this problem too! When your refrigerator is broken it may be running either too warm to too cold. When the refrigerator is too warm it is because of a broken air inlet damper. When your refrigerator is too cold that is because of problems with the thermistor or temperature control. These problems occur in freezers too. We routinely repair refrigerator and freezer temperature problems that occur with all major models and brands. If your water dispenser in the refrigerator is not working, the issue is the water inlet valve or maybe the dispenser actuators not working correctly. It is uncommon for a water dispenser not to work but we still carry the parts and tools to fix this on all major brands such as GE, Sears, Whirlpool, Kenmore, Sub-Zero, and others. When your refrigerator is leaking for has condensation building up inside, the problem is that the door is not closing properly. Perhaps a latch is broken. Or there is a problem with a gasket, seal, or hinge. We routinely make these sorts of repairs so that the door closes properly and the condensation and leaking stop. Along the way, we commonly replace broken or burned out refrigerator or freezer light bulbs as well!